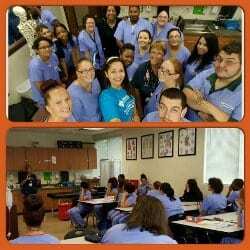 July 8, 2015, Toms River, NJ – Students in the Toms River Medical Assisting class were treated to a guest lecture by Registered Nurse, Susan McKenna. She shared her experiences starting in the health care field as a Medical Assistant, as well as real-world advice for the roles and responsibilities of a Medical Assistant in the Emergency Department, in a hospital, and the medical industry overall. Ms. McKenna’s stories of life as an emergency nurse were compelling! Students especially appreciated her examples of how to maintain professionalism in the workplace as a Medical Assistant. Thank you Ms. McKenna for taking time out of your busy schedule to come and share your experience with us!